Dr Everett Berning had been working on a cure for drug addiction for ten years and was nearing a breakthrough. He was a civilian scientist working at a secret government facility; an underground testing site that he had no idea where. His aim, along with his colleagues, was to not only cure addiction but remove all cravings forever. Tests were done on addicted mice to see if the cure was indeed a cure and not just another blind alley of disappointment and despair. The test proved to be a total success with no side effects. Next would be the human trials; a number of hopeless addicts would be conscripted as the new guinea pigs. One of the human test subjects was, Jesse the teenaged daughter of, Regina, the Chief of Police in Rockport. After the action had started, Regina would be hard pressed to just stay alive while trying to save, Jesse, her family and friends amid all the chaos. 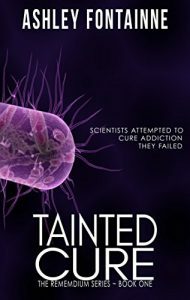 Among the members of the government team searching for the cure was a spy who was keeping the leader of a drug cartel informed of the progress. Leaders of such cartels are always under siege from relatives or underlings who want a quick rise to the top; this situation was no different and a coup was undertaken. When the spy had transmitted the formula for the cure to his boss he already had his own scientists working on a more potent drug to reverse the cure and be more addictive than ever. Too late to recall their shipment of the super-drug to their suppliers they would learn that the drug was killing their buyers; but that was not the half of it. Shortly after death the lifeless victims were resurrected with super-strength, a taste for blood and flesh and driven mad. A bite or a scratch from one of these zombie-like creatures would turn anyone into one of the marching dead in a short time; it was inevitable. What have we done to ourselves, thought Everett? How long would it last and is there enough time to figure it out? They had no idea how this horrific malady was transmitted and Everett had doubts if he could ever figure it out. The answers to this can only be explained in the next chapter of the trilogy: Tainted Reality. The action is so intense and there is hardly time to catch your breath. To my mind it is a very enjoyable read. My only issues with the book is that some of the flashbacks are a little jarring and unexpected. I found myself retracing my steps to see which time frame I was in. There are the hazards of conveying simultaneous action in different locales and flashbacks are one way to do it. It dismayed me when a character was introduced for the first time that Ashley did not supply the surname until sometime later but that’s just my opinion and does not detract from enjoying the story. If you would like to know more about, Ashley Fontainne you can visit her at her website. Click on cover image to make a purchase. Please sign the Guestbook before you leave. Thank you.